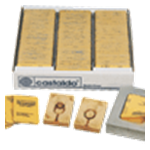 Castaldo Jewelry Molding Rubber has been the industry standard for more than 40 years and continues to be the best jewelry molding rubber available for lost wax jewelry casting. Castaldo White Label®, the less expensive and firmer of our two grades, has a high concentration of pure natural gum rubber, which makes it resilient and pliable, qualities that the experienced mold-maker values in his efforts to produce high-quality molds in the shortest reasonable time. Castaldo Gold Label® contains even more pure natural gum rubber, making it even softer and more pliable. Experienced mold-makers know that this compound’s superior qualities can save them substantially on labor costs when used for difficult molds containing undercuts, where a stiffer mold would break delicate wax patterns or would make their production impossible altogether.